Peirce Mill, a simple stone structure standing at a crossroads in Rock Creek Park, has been called “a symbol of the nineteenth century, when America was predominantly rural and major industries were devoted to transporting, processing, and selling the produce of the land.” It is a survivor, the last remnant of a once-thriving industrial enterprise that included at least eight mills operating along Rock Creek in the District of Columbia. 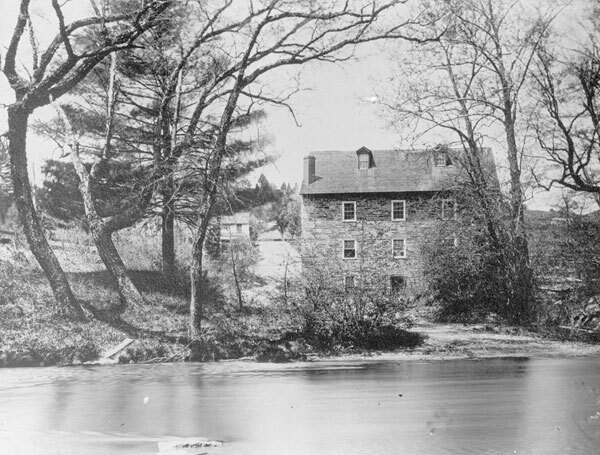 Isaac Peirce (1756-1841), a former Quaker who had emigrated from Chester County, Pennsylvania, built the mill in the 1820s on the site of an earlier mill. Peirce and his family also built a carriage barn, distillery, saw mill, spring house, nursery, and residence near the mill. All were constructed with stones quarried from nearby hills. The Peirce estate included close to two thousand acres that stretched from Linnaean Hill (near what is now Tilden Street, and was once Peirce Mill Road) to the south, almost to the present Maryland border to the north. The Peirces (and later the Shoemakers) owned slaves that tended the fruit trees and performed other farm chores. When emancipation occurred in 1862, there were 32 enslaved persons working on the estate. View of Peirce Mill across Rock Creek, circa 1900 (Library of Congress). The mill pioneered early industrial innovations, incorporating labor-saving devices developed around 1800 by noted inventor Oliver Evans, including grain elevators, screw augurs, and a hopper boy, all powered by a complex array of oak gears and shafts ultimately driven by the force of the turning water wheel. Water traveled from the creek through an open trench or “mill race” to the water wheel, which powered the milling machinery. Local farmers brought their grain—wheat, oats, and corn—to be ground into flour and packed into barrels for easy storage, transport, and sale. Business was brisk through the Civil War, but thereafter market forces shifted. Local milling declined sharply as larger and more efficient mills in the Midwest cornered the market. After a major breakdown of the machinery in 1897, Peirce Mill closed. Congress created Rock Creek Park in 1890 as a natural preserve and “pleasuring ground,” and the mill was already part of it when it ceased operations. 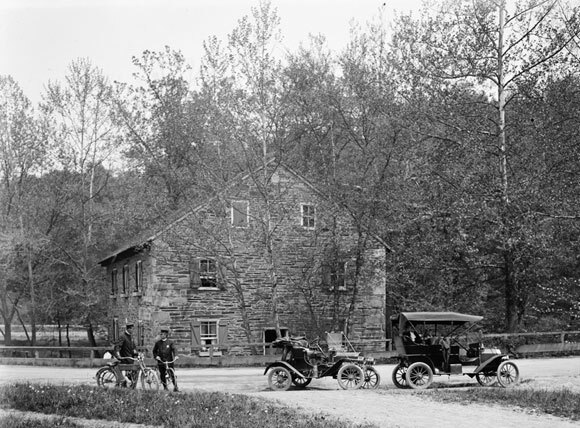 As Washingtonians increasingly ventured into the park on weekend outings in their carriages and early automobiles, the picturesque old mill became a popular attraction. Peirce Mill, circa 1918 (Library of Congress). Between 1905 and 1935 the mill was leased to a series of concessionaires who operated it as a tearoom. Most of the machinery, including the mill wheel, had been removed and disposed of. Then in 1935 the mill was restored as part of a Depression-era Works Progress Administration (WPA) project using authentic wooden machinery from old mills in Pennsylvania and Maryland. Flour produced by the mill was used in government cafeterias during the 1930s and 1940s. Many local residents still remember childhood visits to the mill during this period and can recall the sounds of the whirring machinery and the smell of freshly milled flour. 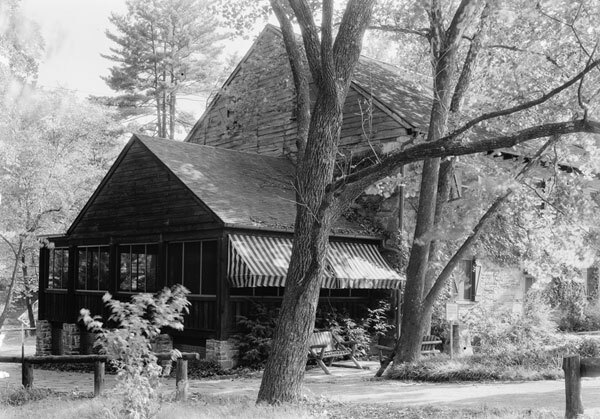 The Peirce Mill Tearoom, circa 1935, shortly before it was removed and the mill restored (Library of Congress). Following additional restoration work in the 1960s, the operating mill was open for visitors throughout the 1970s and 1980s, and samples of wheat flour and corn meal were available for sale. However, rot in the water wheel shaft caused damage to the gears and forced the mill to shut down in April 1993. The National Park Service lacked funds for repair or restoration. Visitation decreased significantly, and hours of operation were reduced. In 1997 the Friends of Peirce Mill was formed as a non-profit organization dedicated to restoring the mill to operating condition. Working with the National Park Service, the Friends organized an extensive restoration and rehabilitation effort that reached a major milestone in 2011 when basic milling operations were restarted after a 17-year hiatus. However, much of the mill’s elaborate machinery still awaits restoration. 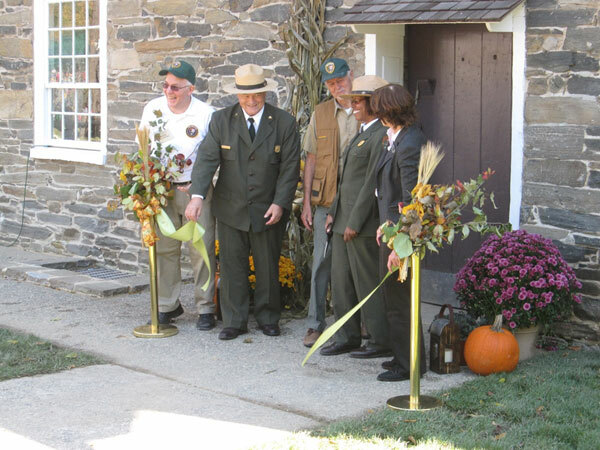 National Park Service and Friends of Peirce Mill representatives jointly cut the ribbon to officially mark the restart of mill operations in October 2011. Despite changes over time, Peirce Mill’s sturdy exterior and interior retain the authentic appearance and atmosphere of a 19th century grist mill, with its original 1820s-era stone walls, authentic wooden milling machinery, hand-hewn beams and columns, and heavy oak floor boards.